This chart illustrates the result of select major bank mergers just prior to 2008. 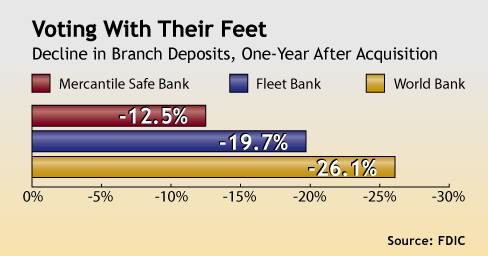 Callahan research shows that bank branch deposits commonly decline by approximately 15-20% in the period following the announcement and completion of a bank merger or acquisition. In 2008, three of the nation's top 15 banks announced they would be acquired suggesting unprecedented deposit capture opportunity for credit unions. To learn more about opportunities from bank mergers in your area, check out Branch Analyzer, our new market share analysis tool on the nation’s 100,000 bank and credit union branches.